Heroes: Erkenbrand. He could be the strong infantry hero that they so badly need, now that they've lost Aragorn and Gimli. One of his powers could be a horn ability. Upgrades: Disciplined Horses. I've noticed several things in the INI files regarding cavalry "dieing". It seems it'd be possible to make it so that there is a chance the horse could survive, then go back to the nearest stables to pick up another rider. It would be unique and goes well with the fact they're supposed to be horsemasters. Upgrades: Bows of the Galadhrim. Allows elven archer units to equip this upgrade, which increases their attack range by a good amount (10-20% I'd say, depending on their current attack range). Heroes: Quickbeam. He'd be the opposite to what ents normally are. He'd be very quick (slightly slower than cavalry? ), but have less armour/health than other ents. Upgrades: Ent Draughts. Adds a passive healing effect to the entmoot. Heals ents and heroes (maybe only hobbits) quite quickly. Units: Knights Of Dol Amroth. Strongest cavalry in the game. Very high stats, although noticeably slower than most cavalry due to heavy armour. Heroes: Imrahil. To go with his knights . Heroes: Faramir should be moved here IMO. Imrahil or Beregond could take his place as the Gondor hero. Heroes: Wormtongue. The "hobbit" of Isengard. Maybe cost a bit more than them, and have better abilities though. Units: Maybe a light cavalry that have good damage against structures? Heroes: Some Dunlending chieftain that gives leadership only to Dunland warriors. Will try to find a name for him. Upgrades: Olog Hai. An upgrade that once purchased gives large boosts to all trolls, without needing to individually upgrade them. Would obviously be quite expensive. Units: Black Serpent Cavalry. A fairly strong cavalry unit, although they should need to outnumber enemy cavalry in order to defeat them. They also need Mumakil (I guess it was just a mistake not including them ). Heroes: They need the chieftain who tried to kill Theoden, although I can't think of a name for him. He should be good alongside the black serpent cavalry, but very weak on his own. Upgrades: Great houses (probably needs better name). Adds the "houses" onto the backs of the Mumaks, thus allowing them to be garrisoned. Before this upgrade is purchased the mumaks are basically just normal elephants . Upgrades: Dread of the Nazgul. All Morgul buildings cause fear to nearby enemies. Not sure if it's possible to code, but would be cool and unique. Woah... you seem to have too much spare time. No, honestly this is very appreciated. We thought about that. Especially about the horn since there was a good button for it. Though we already have more than enough heroes and I hate it when it lists them up on the right side (which happens as soon as you get the tenth hero). But we will discuss it again. Disciplined Horses. I've noticed several things in the INI files regarding cavalry "dieing". It seems it'd be possible to make it so that there is a chance the horse could survive, then go back to the nearest stables to pick up another rider. It would be unique and goes well with the fact they're supposed to be horsemasters. We were quite sure to include something like that, but because we might totally redesign the way how the elven units work, we can't tell yet. nits: Knights Of Dol Amroth. Strongest cavalry in the game. Very high stats, although noticeably slower than most cavalry due to heavy armour. Heroes: Imrahil. To go with his knights tongue.gif. We thought about making Dol Amroth another mini-subfaction for Gondor, so they would be placed there. That's right, Faramir should be moved... this needs further discussion. Another very good idea. This one will most likely be included. As for Dunland, we still need to think of something special, so we'll return to this later. Not sure if this wouldn't make it a bit imbalanced. Since you actually only have a good chance to kill trolls when you have some distance and use archers or such. Harad is the same as Dunland, we just didn't mess with them enough to make more decisions, but your ideas will be considered again when the time is right. Will be done but we only have one building, so it will most likely also decrease damage or armor. They were just great! Thanks a lot. Well I'm glad you like my ideas. Any area you particularily need ideas for? No, atm, we're just fine with our ideas and all the ideas you gave us. Not really. Or the changes aren't visible enough for me to see it... which is the same as no changes. I played and gave special attention... it does change... quite nice actually, but it's very hard to see. First of all, these are great ideas(I've had similar ones on other sites) but I have a few more. 1. Variety. Like, the rohirrim shouldn't all have spears they should have an assortment like swords and axes thrown in, to make it more realistic. 2. Survivors. With cavalry, there should be a 1 in 10 chance that when the cavalrymen is killed, he survives, and the horse dies. The man becomes a foot soldier and can get another horse at the stable, or continue on foot. Don't know if it's possible, but it would be cool. 3. Knights of Dol Amroth can mount/dismount. Sword and shield on foot and lance and shield on horse. Other than that, sounds great so far, keep up the good work ! Already done, some have swords, some have axes and some are the original ones, with spears. We'll do it the other way round. Some horses will survive, and you can refill them with riders at the stables. Believe me, this is really hard. I've been trying to do that for a while, without success. Maybe I will try again though. Edited by Dark Lord of the Sith, 23 September 2006 - 05:11 PM. Been a long time since I posted ideas here, but I've been thinking about banner carriers. IMO, they should get a much improved armour, and also be effected by upgrades that the horde receives. I'd also like it if you could trigger a demoralizing effect for when banner carriers are killed (obviously without their buffs that would be annoying though), as units would tend to get disheartened by their banners lying on the ground. Edited by gandalf the unwise, 17 December 2006 - 11:06 PM. I know, Cel's are absolutely top. We've planned a redesign anyway, so it might come sooner or later. Planned, but they still have the same skin as the ones on foot atm. Also planned (model already done), but needs some special implementation, as we don't want to screw up Rohan's early gameplay with the peasants. 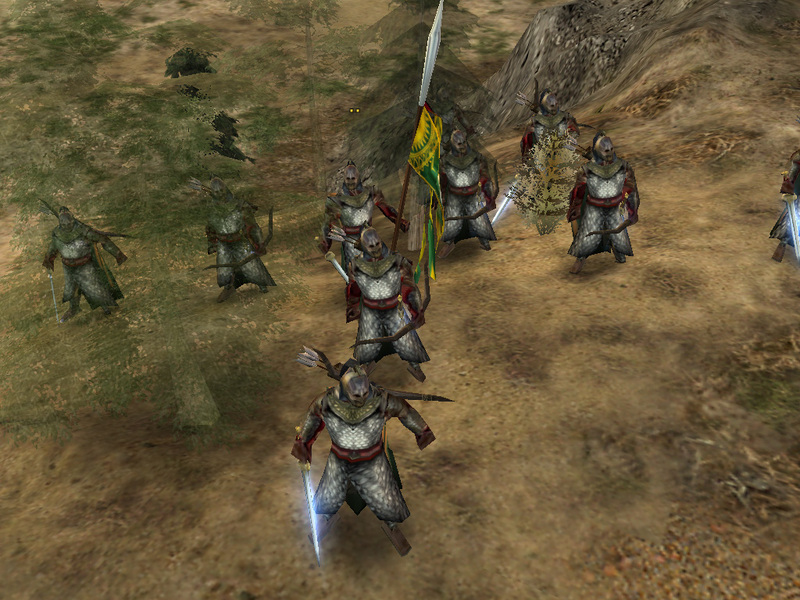 Uruk scouts are already in, and at the moment some of the normal Uruk Fighters have shields. That might be a good idea, but we already have a huge list of other Mordor or Morgul orcs, so it might get a bit unbalanced. It's definitely worth some thoughts. Thanks a lot, we appreciate every input. Oh and fix your signature *hint* (a "]" is missing at the end).